Star Wars Dawn of the Jedi is a series with a whole lot of promise..but has been slow moving. 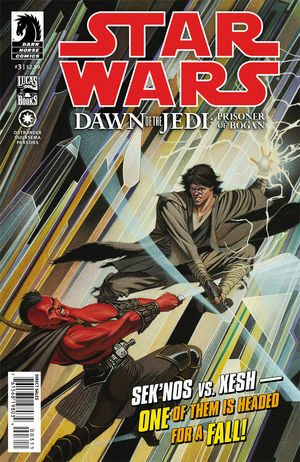 Xesh is an awesome character though and the cover image – really is the highlight of this issue – Xesh – the ‘bad guy’ fighting a pure blood Sith (aka the J’eedai good guy). Still interesting for us to see light sabers as being a novel/new idea and not common place.